The "JIMOTO Made Series" is one that Starbucks launched to connect strongly and deeply with regional artisan roots. The pay homage to the developed craftsmanship traditions throughout Japan, built to showcase the traditional crafts that are active in the local area and products incorporating the craftsman's technology. They are only sold in limited stores based on the regional interests they depict. 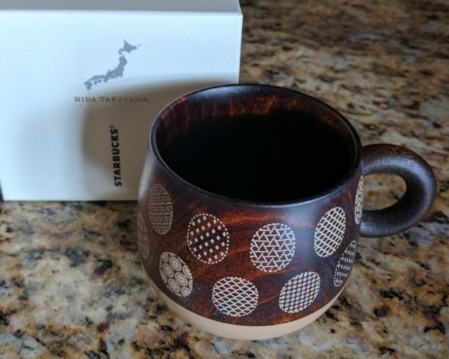 The first of the JIMOTO Made Series was an iced coffee glass by Edo Kiriko; the second was a coffee aroma mug reminiscent of Tottori sand dune, the wood mug set is the third installment of the series: The Black and White Wooden Lacquer Mugs featuring Fukuoka with traditional craft lacquer of Gifu and Takayama Koishihara grilled coffee aroma mug in the Chikuzen area. The White version is a wooden mug that expresses design motif inspired by the pattern of Hida sashuko with lacquer. The Wooden Mug in this set is carefully finished by hand, one-by-one, by Hida Takayama Craftsmen. The mug's purpose is to connect with the skills and feelings of craftsmen included in the design.